Montalvo is located in the heart of Silicon Valley, a place that has fostered technological innovations that have transformed our contemporary experiences of place and time. With the advent of digital media, moviemaking is among the diverse industries that have been reshaped by advances in computer technologies developed in this region. This exhibition will feature three multi-media installations by Madrid/Montreal based artist Daniel Canogar in which the artist appropriates and repurposes obsolete cinematic technology. 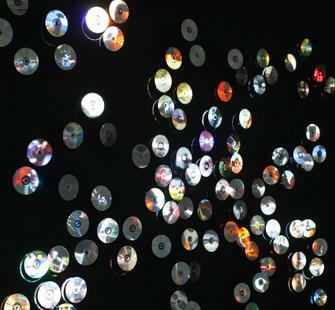 For Spin, Canogar reuses 100 discarded DVDs, projecting their copied content onto their mirrored surfaces and combining the DVD’s diverse soundtracks to create an acoustic experience. In a related work, the artist projects video animation over an environment constructed from VHS videotape. Premiering in the Project Space Gallery, Flicker involves a projection over 35mm celluloid film. With its exploration of the accelerated speed of technological innovation, and our conditioned response to cast off the old in favor of new, The Film Trilogy extends our yearly examination of the relationship between time, history and place. Join us for a FREE Closing Reception and artist's talk on Friday, October 12, from 6:30-8:30pm! RSVP on our Facebook page.